The estuary at Urunga, northern NSW, is always worth a visit. Over a kilometre of boardwalk provides access over the shallows and into the mangroves. 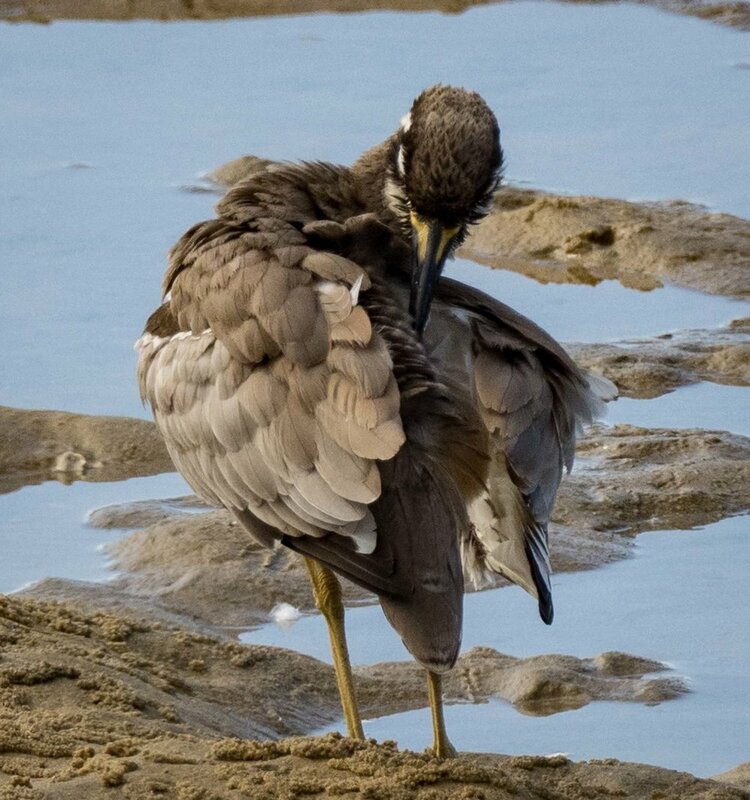 There are resident Beach Stone-curlews. And the crabs of the mudflats put on quite a show when the tide is out. The tide was dropping when we arrived, and the fish-eating birds were feasting. As we were watching some resting terns, trying to identify them, they suddenly took flight and started to feed. 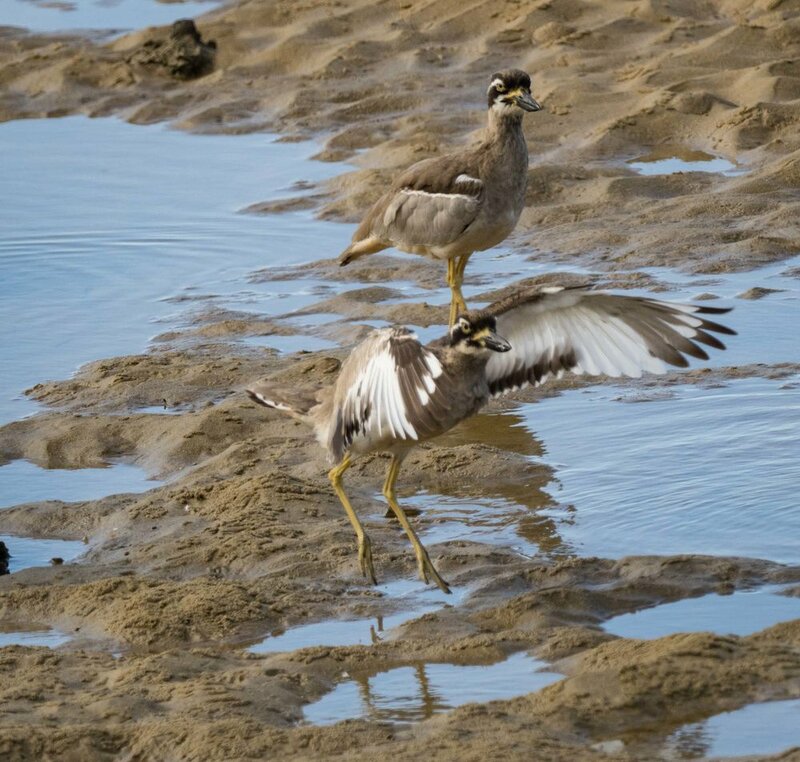 Gliding, then swooping suddenly to pick food from the sand flats with large, black beaks. Unlike many terns, they didn't dive into the water ... and this behaviour helped us confirm their identity. Gull-billed Terns, a species we don't often see at home. The terns were no doubt taking crabs, and as the tide continued to fall various crab species appeared ... in huge numbers. The sand flats were teeming with Soldier Crabs (Mictyris longicarpus). This beautiful blue species is common across northern Australia, extending all the way down the NSW coast. 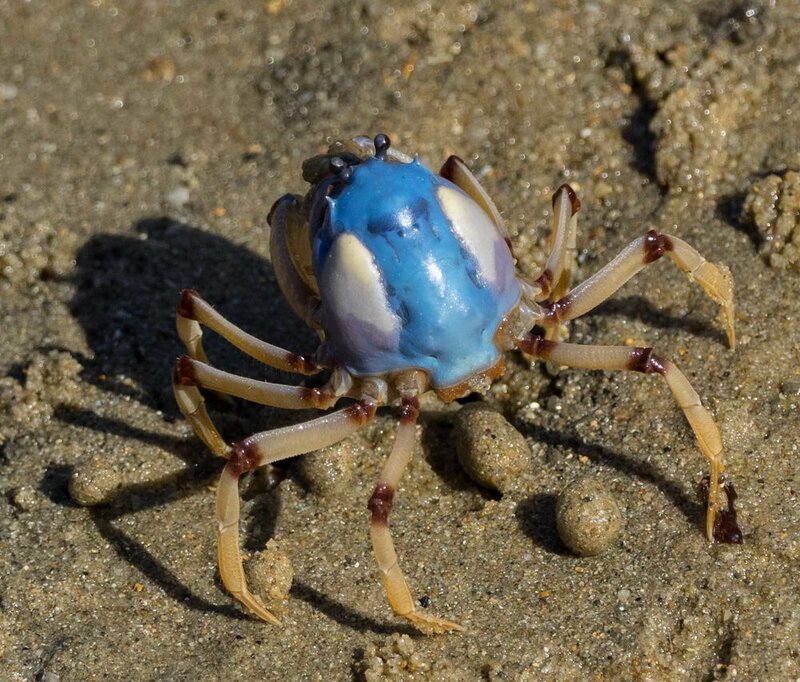 Soldier Crabs sift the sand for single-celled algae and detritus, leaving characteristic balls of sand in their wake. A close look at the large crabs shows them oblivious to their smaller kin. If they're not careful, the little grey-coloured ones get stomped on, buried, and even swept up as the larger ones feed. But it's not just Soldier Crabs that emerge at low tide. The more 'gooey' mud beneath the mangroves is home to various small - and colourful! - crabs. 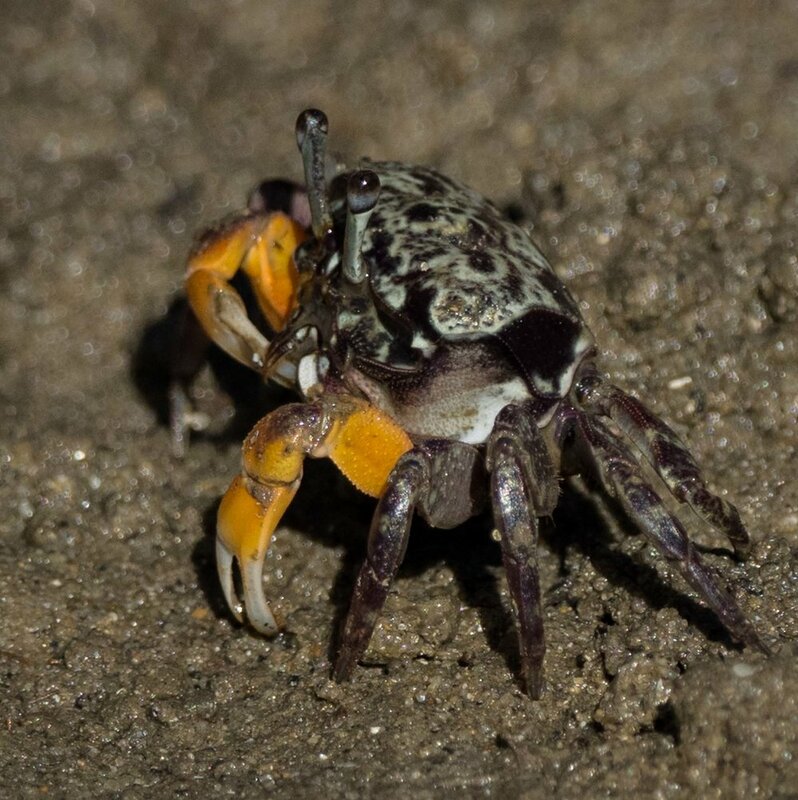 Orange-clawed Fiddler Crabs (Uca sp.) are distinctive. 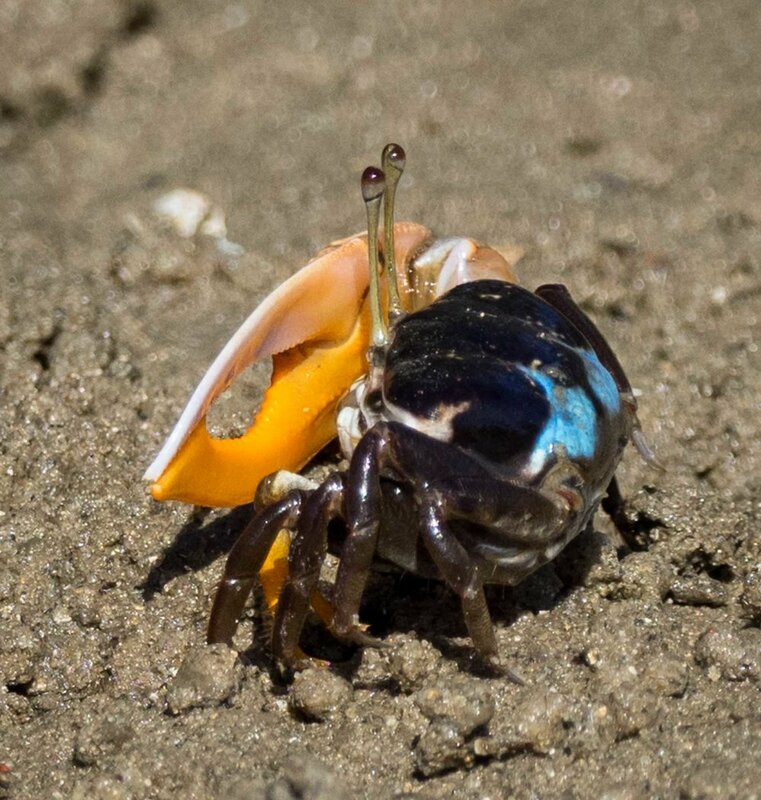 The males have one huge, orange claw, used to discourage other males and to attract females. 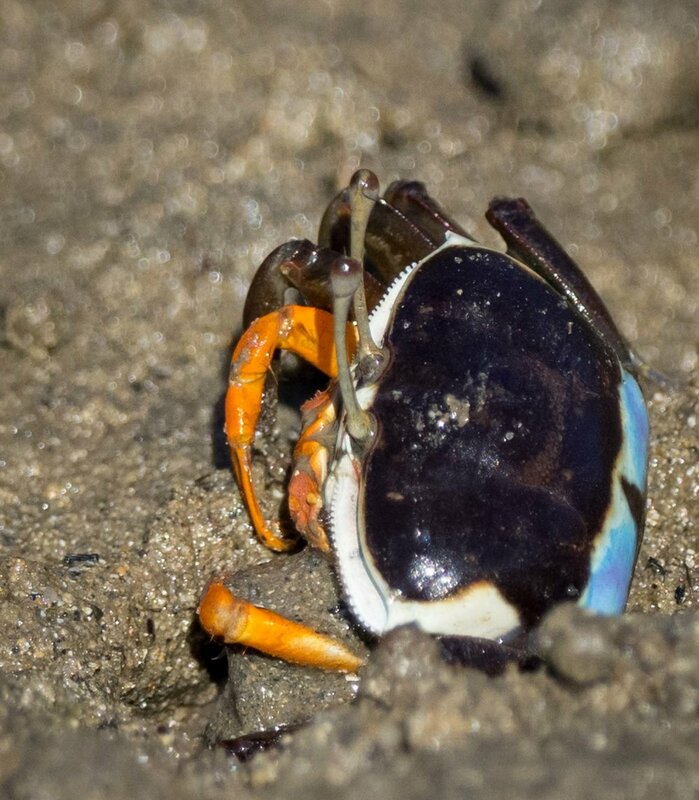 The mangrove mud was also teeming with Semaphore Crabs (Heloecius cordiformis). These square-bodied crabs are common along the east coast. Like the Fiddler Crabs, they have very long eye stalks. The claws are purple on adults, but most of the ones we saw were orange-clawed juveniles. 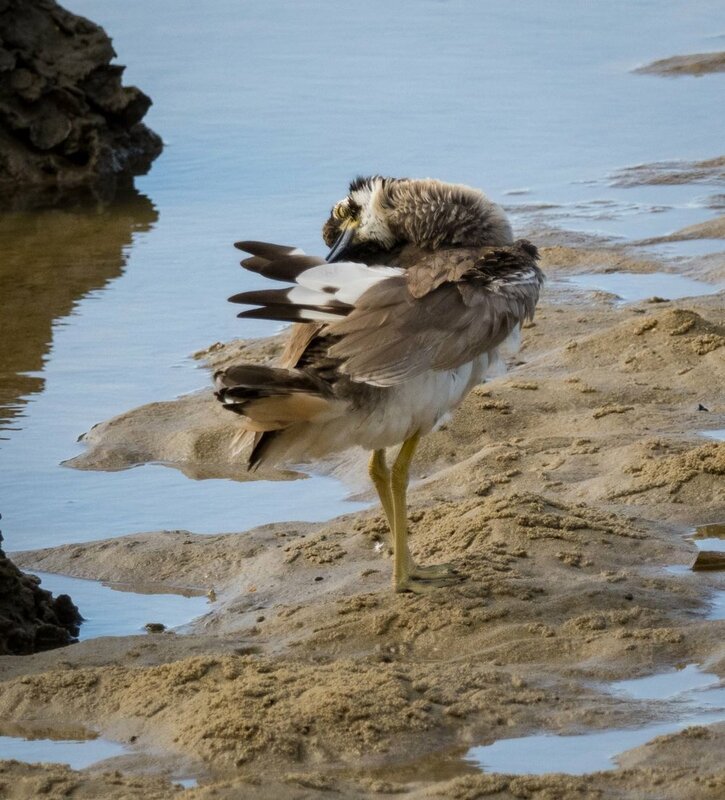 They picked over the mud and occasionally dragged mangrove seed pods to their burrow openings. 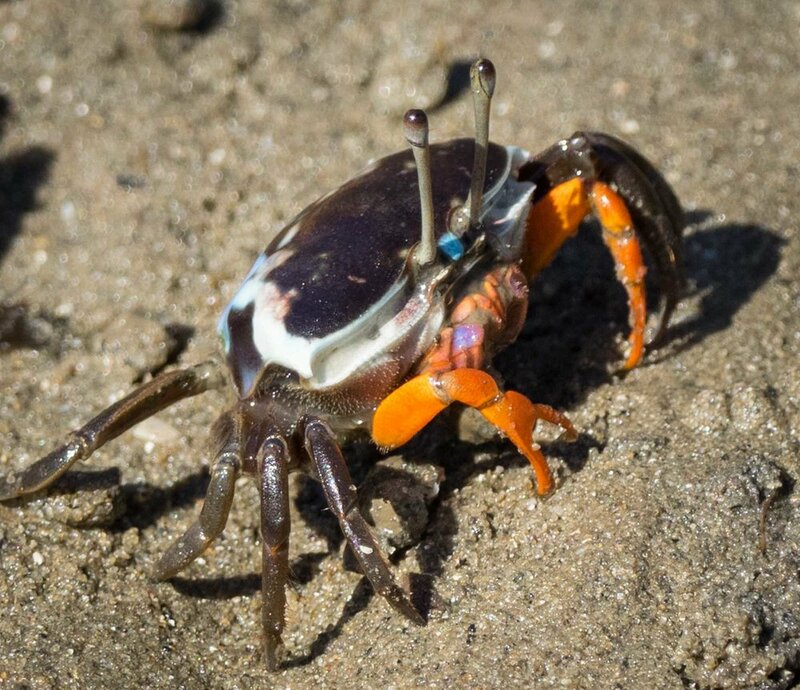 Apparently some mangrove crabs horde pieces of vegetation in their burrows, to graze on in safety. 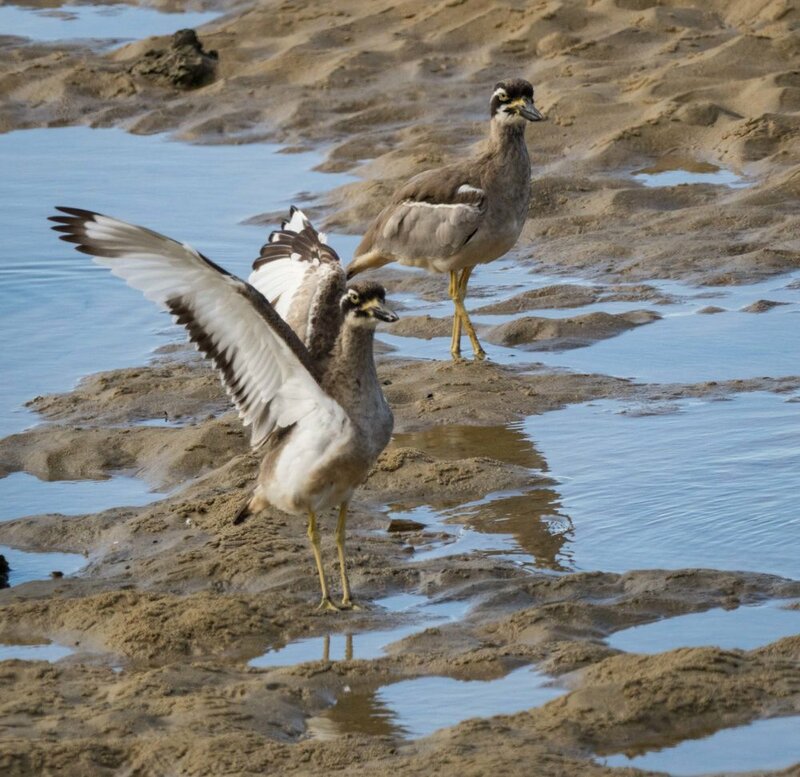 A pair of Beach Stone-curlew are resident in Urunga, and it is clear that the community is very protective of these endangered birds. Their small stretch of beach and mangroves is kept dog-free, and people are encouraged to keep their distance too. And the birds seem to be doing well. Again this season they have a young one with them. Offspring remain dependent for up to 12 months. This one was nearly the size of its parents, but still seemed to be practicing flight. At least one parent remained on guard with the immature bird, even when the other adult moved away to feed. 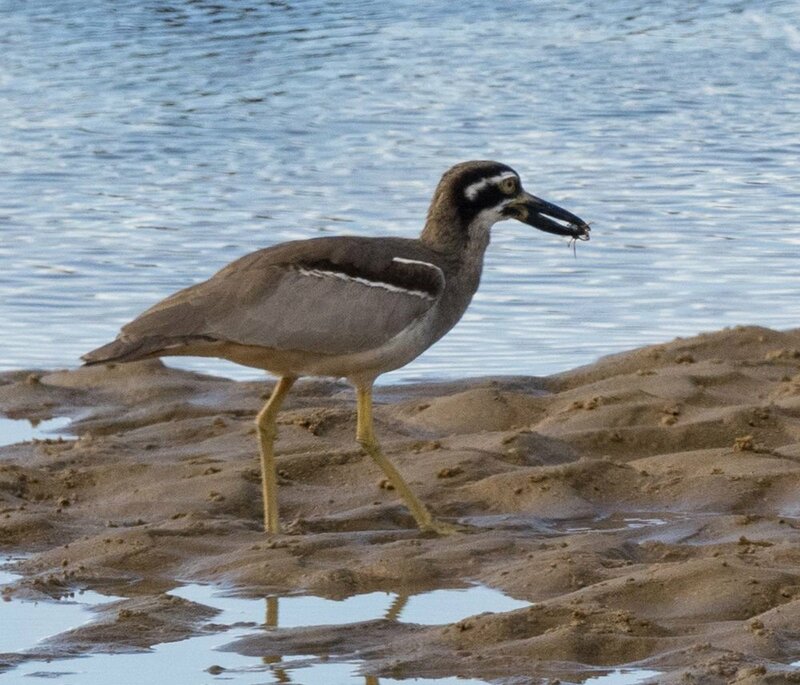 Beach Stone-curlew love Soldier Crabs! The massive beaks of these birds are well suited to their diet of larger crabs, but they are quite happy to take the softer, defenceless Soldier Crabs too. 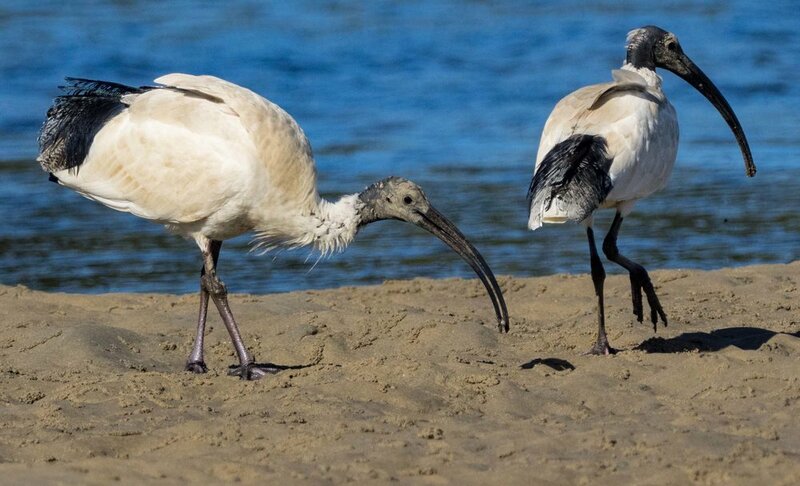 The Soldier Crabs hordes also provide food for more common birds, such as these Australian White Ibis. They're surprising elegant birds when feeding like this ... rather than scrounging in a rubbish bin, picnic area, or farm field! An added bonus for our visit: a Square-shouldered Kite and a Brahminy Kite both making low and close passes over the mangroves. I managed to catch a few shots of the Brahminy, but missed out on the much rarer Square-tailed ... a challenge for another day. And Torresian Crows. 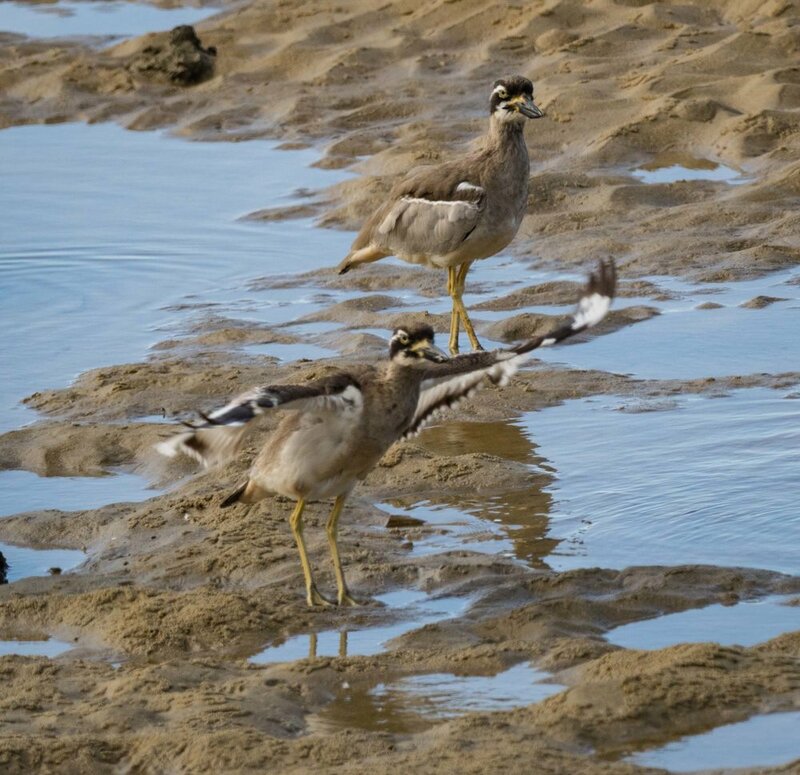 These birds are common across northern Australia, but less so here in NSW. The north coast of NSW is their southern limit.